Nick Schley’s Abiding Perdition is a comic reworking of Little Red Ridng Hood. What this entails is a clunky sword and sorcery treatment of the fairytale. The artwork is great although it does suffer from Chris Achilleos Syndrome. What I mean by this is Schley occasionally tends towards improbably large breasted female characters that eschew armour in a dangerous situation in favour of skimpier attire. In the first issue the clunky narration frequently takes up half a frame or more detracting from the artwork and reducing narrative elements into simplistic cliche’s. The story does improve in issues three and four but the story and dialogue remain the titles main weakness. Red, the herione of the piece, is sadly quite forgetable. She is a stereotypically fiery red-head hell bent on revenge against De Grey her nemesis. Her impetousness while in character soon becomes quite irritating. She had far more charm as a child in the first issue. A big sword and big bosoms are no replacement for character development. Bor Errison the adoptive father of Red is an interesting character, with a fairly different look. In fact on first appearance he seems fairly villainous with his oakveil. In fact his back story adds most of the meat to the comic and brings the villainy of De Grey into tight focus. Noctura is a for want of a better description a goth bimbo with magic powers. She brings little to the story but her cleavage. This title has a big underground following but personally I can’t understand why. All of the elements are there but the writing isn’t strong enough to hold it all together. I may be too harsh this early in the series but you can judge for yourself. 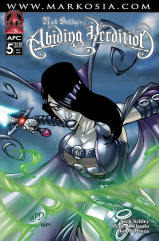 Abiding Perdition is available from Markosia in print and in E-book form from Drivethrucomics. GReat to see an honest and straight forward review. It is appreciated you took the time to read the book much less type up a review.